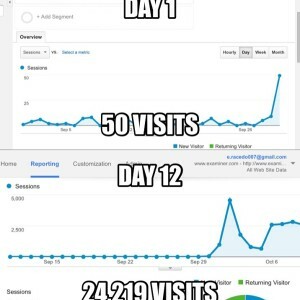 Over the years we’ve built a reputation for making content that goes viral (in particular, we write articles that attract a lot of attention). 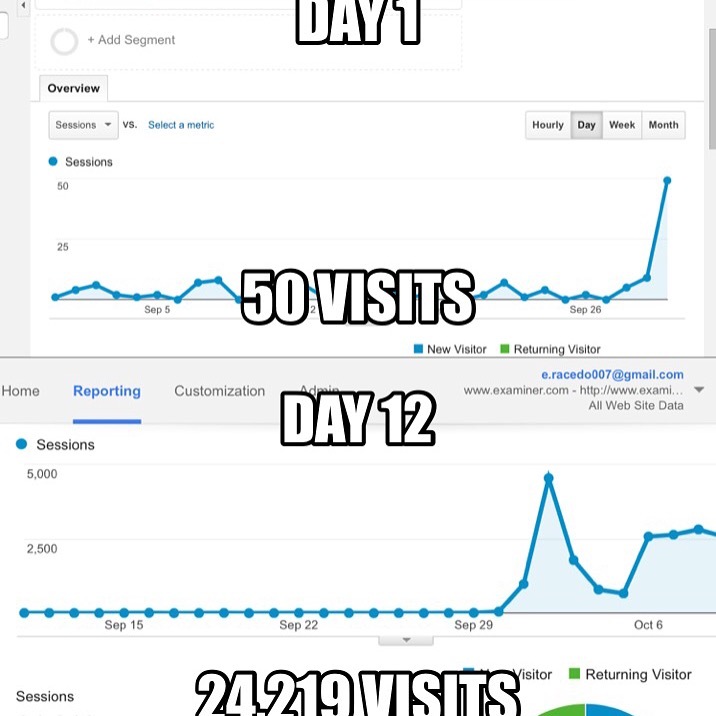 In the picture to the left you’ll see an article that we wrote in September that had over 24,000 visits in 12 days. Doing this took time, research and money, but it paid us back several times over. Rather than going into a bunch of theory of why some content goes viral and other content doesn’t, we’re just going to get right into what we did to make this particular article go viral so that you can do the same for your business. This is a very simple process that almost anybody can do. First off, if you don’t feel confident in your writing, or you’re just not sure if your content is going to be interesting enough, try Zach the writer. He’s a professional writer who will research and create incredible content on your behalf for dirt cheap (you can also go with these guys if you don’t want to spend much more than $5). With that being said, here’s a few ingredients that you should have in every article you write. The first three points are going to make or break your article. They’ll determine whether a person is going to read your article or not. Most people will judge your article by these first three things. It’s sort of like your “elevator pitch” to getting someone to read your writing. Now, if you don’t know that you can do this, there’s no shame in hiring a writer to do it on your behalf. The last point mentioned there is that the article is related to your company. If you’re a plumber, don’t start writing about your favorite football team. We’re all interested in things outside of our profession, but you want to attract people to YOUR COMPANY, and not your favorite football team. A few other important points to pay attention to are the length of your article (should be over 500 words) and the keywords in your article (which help with your SEO). A landscaper could write an article on how to winterize your sprinkler system (which is heavily searched for on Google). This may or may not directly make the landscaper money, but it puts your brand in front of a lot of people who are likely to call you later on. Tell 10 or so people, “Hey ______, I just wrote an article for my company and I wanted to see if I could get your feedback. Would you be willing to check it out?” Mostly they’ll say yes. Some won’t respond, some might be too busy. Don’t be offended, just move on (it’s a numbers game). Mostly people will tell you it’s great. Some might make a recommendation or two. Feel free to make any changes you see fit. The important thing is now you need to ask them to share it. Here’s a great way to get your friends to share: “I appreciate your feedback! Is there any way I could get you to share it on Facebook when I release it?” More often than not your friends will help you out after they’ve already committed some time to the article and they’ve given their feedback and opinions. It’s that simple. Don’t try to con your friends or guilt them into sharing your content. Make them a part of the experience! When you do this it will show up in your Facebook feed as multiple friends sharing the same article. This makes it look popular to all of your mutual friends and gets them into it too. NOTE: Use hashtags in your social media posts. Hashtags help people find your content on social media. The next part of what we do is we push the content out everywhere! Social media is key in getting your content out. If you’ve ever written an article on your website that didn’t get seen by anybody, you just didn’t promote it enough! We like to use several services to get our content out all over the web. First off, you can try these guys who will share your content 1,500 times on places like Twitter and Facebook. Another great service that we often use is this one. It costs a little more than the first, but you get more value with it. Remember to use hashtags in your posts! The last thing that we like to do when sharing content is to advertise it a little. Now this isn’t necessarily going to be a “must do” for everyone. At Zing Marketing we spend thousands on social media and Pay Per Click ads. If you’re willing to spend some money to promote your content, we recommend using Facebook. You can do this through your Facebook business page (if you don’t have a Facebook business page, you need to have one). You can also use Google AdWords and set up a campaign that targets a high search volume with low cost per click. Facebook and Google Marketing are services in themselves that are often out-sourced to companies like Zing. If you don’t know how to market on Facebook and Google, we highly recommend you consult a pro (it could cost you a lot of money otherwise). Marketing in general is a game of getting your brand in front of a lot of people. That’s the simplicity of it. When you write something of value for your potential customer and it doesn’t cost them anything, you’re making your brand well known and well thought of. Feel free to email us any time and let us know if this article helped you out! You can also email us for free advice on how to write articles and make viral content! I see what you mean, Ed. It might be a good idea to start off with something small and just start writing a few articles on your site here and there.